Can you imagine receiving notice that you have a package to pick up even though you know you haven't ordered anything and going to pick it up and seeing it's from Blue Mercury which you know to be a high end beauty store that you usually go into to just stare longingly at expensive nail polishes before leaving empty handed? And then you open it up and you see your dad has read your dumb beauty blog and sent you ALL FOUR of the new Deborah Lippmann Mermaid polishes as a really generous surprise?? Just imagine me in that moment. I almost passed out. Look how beautiful these polishes are just sitting in the bottle. This is probably one of the most appropriately named nail polish collections ever. 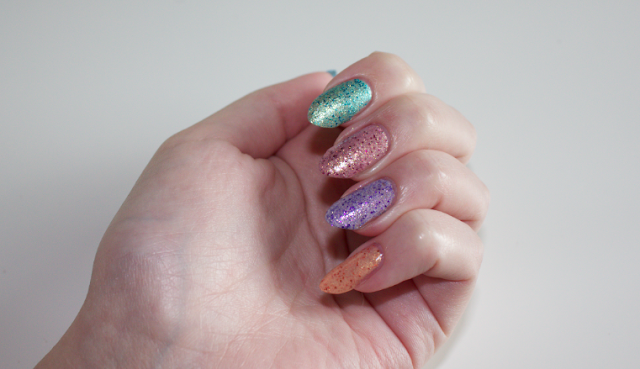 All the colors are so summery and the finish is this slightly textured glittery foil, like something you'd imagine real mermaid scales to look like. The best part is that some have a duochrome-y silver or gold sheen that makes them extra gorgeous when they catch the light. On my index is Mermaid's Dream, the original that inspired the rest of the collection. This is still my favorite. It's a beautiful warm seafoam green with a slight hint of gold shimmer and small pieces of medium blue glitter. 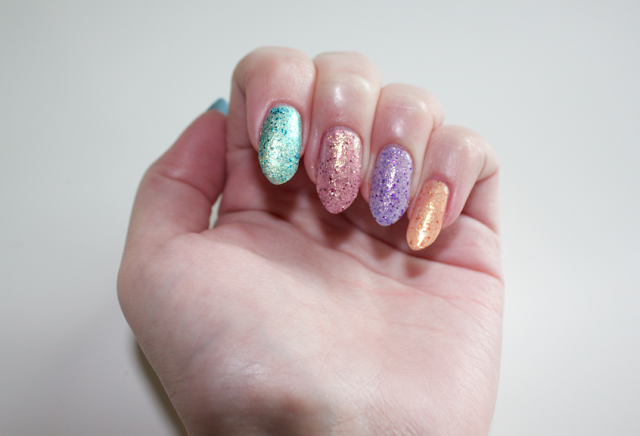 My middle finger is Mermaid's Kiss which is the standout of the new collection. It's a rose pink with this strong gold shimmer and two shades of pink glitter pieces. It's gorgeous when it catches the light. My ring finger is Do The Mermaid, a lavender with a slight gold shimmer with bright purple glitter pieces and micro-glitter. My ring finger is Million Dollar Mermaid, a tangerine with orange glitter pieces with a slight hint of gold shimmer, barely visible against the orange base. 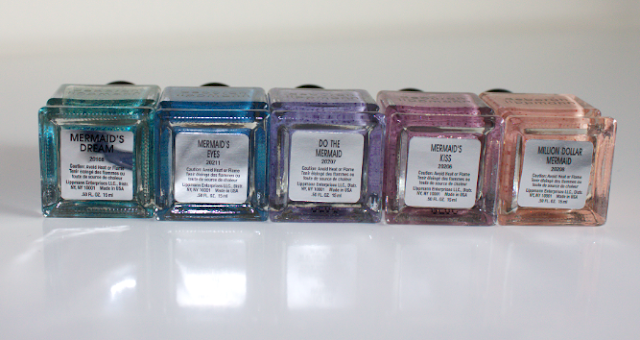 The blue shade, Mermaid's Eyes, doesn't really mesh with the rest of the collection. 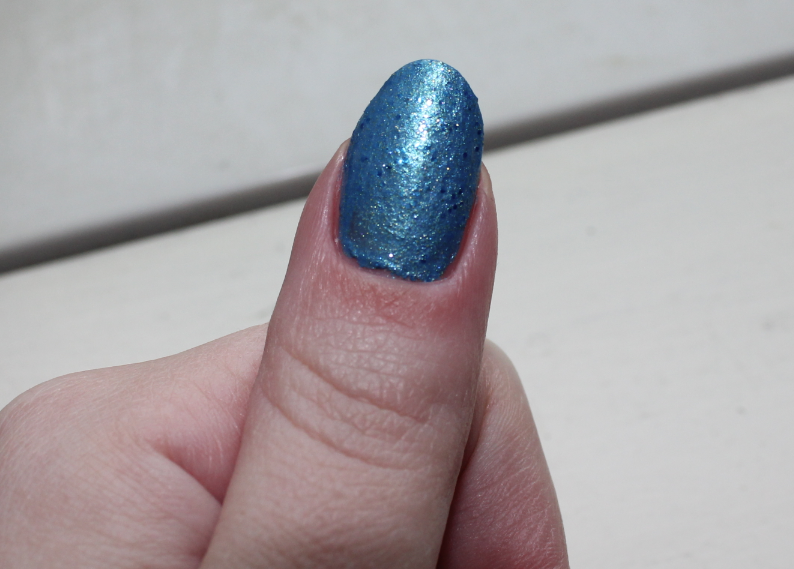 The base blue color is too close to the blue glitter pieces. The base color is also thicker than the rest of those in the collection and kind of swallows up the glitter. The gold shimmer in this come out as tiny glitter pieces instead of a duochrome shimmer as it does in the rest of the polishes. I wish the blue glitter pieces were more of a navy than a medium blue and that there was a silver shimmer instead of the small gold glitter. It's a polish that actually looks better with one carefully painted coat rather than two - this seems to be slightly effective at combating the opacity problem. The wear on these polishes isn't the best. They're textured, shimmery and have glitter pieces in them which makes them prone to chips and tip wear. You probably won't get more than two days of wear with these polishes if you work with your hands often. Wearing a sticker base coat like Orly Bonder Base helps with these problems but with polishes like these the chips end up being a big bigger and therefore more noticeable. I suspect Million Dollar Mermaid and Mermaid's Eyes might wear a little better than the other three since their finish is less textured. The dry time is exceptional but you might have to clean up the tips if the glitter in the polish has made them look jagged. 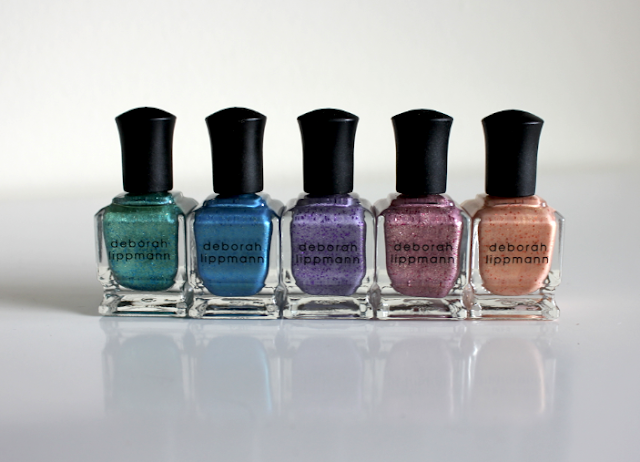 Deborah Lippmann is probably the most over priced nail polish out there and these are no exception at $19 apiece. I feel really lucky that my dad gifted them to me which was super generous and thoughtful. I would still be thrilled with Mermaid's Dream and Mermaid's Kiss if I had paid for them with my own money. They're both incredibly eye catching and without hesitation I can say that they're my two most unqiue and beautiful polishes, hands down. I have hundreds but I can easily say that I own nothing like any of these five polishes. I've heard of a dupe for Mermaid's Dream being sold at Urban Outfitters but I don't think it's available anymore. I'm surprised that more dupes haven't been released since Revlon has created at least 5 Lippmann dupes in the past two years and lines like Sally Hansen Complete Salon Manicure have been stepping up as well. I usually stick to buying these drugstore dupes because they're a very similar look for a quarter of the price and paying more than $8 for a nail polish is a bit extreme. Still, Mermaid's Dream and Mermaid's Kiss are worth their price. There's no colors that even compare on the market right now and they're breathtaking, prized additions to my collection. I'd splurge for the two and consider the purple shade, Do The Mermaid as well.